The popularity of CBD oil supplements has skyrocketed over the last two years, and this year CBD debuted on the 22nd Chiropractic Economics Salary & Expense Survey. In its first year included in the magazine survey, doctors of chiropractic across the U.S. reported 26% of offices and clinics now sell CBD products, even as some states wrestle with allowing the sale of CBD. Cannabidiol, commonly known as CBD, comes from the hemp plant which contains only trace amounts of THC and will not get product users “high” like its cousin marijuana. CVS Pharmacies recently announced they will sell CBD products in Alabama, California, Colorado, Illinois, Indiana, Kentucky, Maryland and Tennessee, while Walgreens will sell CBD patches, sprays and creams in Colorado, Illinois, Indiana, Kentucky, New Mexico, Oregon, South Carolina, Tennessee and Vermont, according to media reports. CVS Health is already reportedly selling CBD in some states. 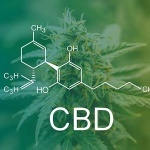 While it has yet to receive U.S. Food & Drug Administration approval, consumers are flocking to CBD for touted benefits including pain relief, treating depression and anxiety, alleviating cancer symptoms, dealing with symptoms from common neurological disorders such as multiple sclerosis and epilepsy, and more. Stores selling CBD are appearing in cities and towns across the U.S. Projected sales generated by the hemp-CBD market will grow from $390 million in 2018 to $1.3 billion by 2022, according to the Hemp Business Journal. The 2019 Chiropractic Economics Salary & Expense Survey results include more than 800 responses from doctors of chiropractic in the U.S. The survey is the go-to source for annual salary data and trending information in the chiropractic industry. To receive the full survey results, click here for a free subscription to Chiropractic Economics magazine, including the results of the 2019 Salary & Expense Survey which will appear in issue #8 mailed in late May.